Karen Zeigler is a demographer and Steven A. Camarota is the director of research at the Center. Newly released Census Bureau data for 2016 shows that a record 65.5 million U.S. residents five years of age and older spoke a language other than English at home. The number is up six million since 2010 and has increased by nearly 34 million since 1990. As a share of the population, more than one in five U.S. residents now speaks a foreign language at home. 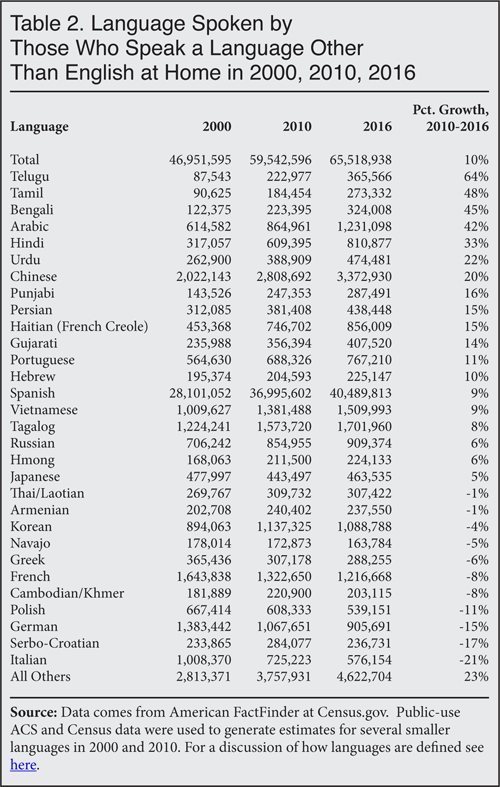 The largest percentage increases since 2010 among languages with more than 400,000 speakers were for Arabic, Hindi, Urdu, Chinese, Persian, Haitian, and Gujarati. Hindi and Gujarati are spoken in India; Urdu is spoken in Pakistan. In 2016, a record 65.5 million U.S. residents (native-born, legal immigrants, and illegal immigrants) spoke a language other than English at home. The number has more than doubled since 1990, when 31.8 million spoke a language other than English at home. Taking a longer view, the 65.5 million foreign-language speakers in 2016 is almost triple the number in 1980. As a share of the population, 21.6 percent of U.S. residents speak a foreign language at home — nearly double the 11 percent in 1980. Of languages with more than 400,000 speakers, the largest percentage increases since 2010 were among speakers of Arabic (up 42 percent), Hindi (up 33 percent), Urdu (up 22 percent), Chinese (up 20 percent), Persian and Haitian (each up 15 percent), and Gujarati (up 14 percent). Hindi is a national language of India, Urdu is the national language of Pakistan, Persian is the national language of Iran, and Gujarati is spoken in India. The largest numerical increases 2010 to 2016 were among speakers of Spanish (up 3.5 million), Chinese (up 564,000), Arabic (up 366,000), Hindi (up 201,000), Telugu (up 143,000), Vietnamese (up 129,000), Tagalog (up 128,000), Haitian (up 109,000), Bengali (up 101,000), Tamil (up 89,000), and Urdu (up 86,000). Telugu and Tamil are spoken in India and Tagalog is the national language of the Philippines; Bengali is spoken in India and is also the national language of Bangladesh. Languages with more than a million speakers in 2016 were Spanish (40.5 million), Chinese (3.4 million), Tagalog (1.7 million), Vietnamese (1.5 million), Arabic (1.2 million), French (1.2 million), and Korean (1.1 million). The data released thus far indicates that nearly one in four public school students now speaks a language other than English at home.1 In California it is 44 percent, and in Texas, New Mexico, New Jersey, New York, and Nevada roughly one in three school-age children speaks a foreign language at home. 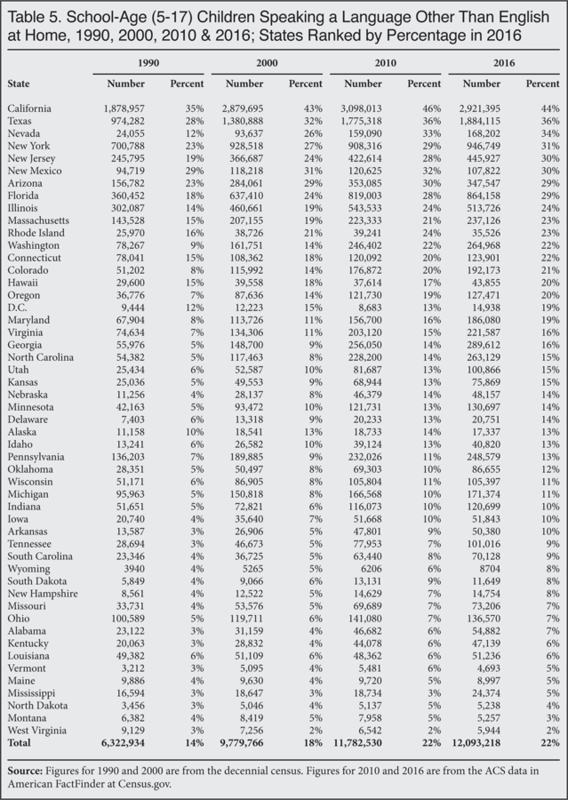 States with the largest share of their populations speaking a foreign language at home in 2016 were California (45 percent), Texas (36 percent), New Mexico (34 percent), New Jersey (32 percent), New York and Nevada (each 31 percent), Florida (29 percent), Arizona and Hawaii (each 27 percent), and Massachusetts (24 percent). Data Source. In September of this year, the Census Bureau released some of the data from the 2016 American Community Survey (ACS). The survey reflects the U.S. population as of July 1, 2016. The ACS is by far the largest survey taken by the federal government each year and includes over two million households.4 The Census Bureau has posted some of the results from the ACS to American FactFinder on the Bureau's website.5 It has not released the public-use version of the ACS for researchers to download and analyze. However, a good deal of information can be found at FactFinder. Unless otherwise indicated, the information in this analysis comes directly from FactFinder. There are three language questions in the ACS for 2010 and 2016. The first asks whether each person in the survey speaks a language other than English at home. Second, for those who answer "yes", the survey asks what the language the person speaks at home. Third, the survey asks how well the person speaks English. Only those who speak a language at home other than English are asked about their English skills. The 1980, 1990, and 2000 decennial census (long form) asked almost the exact same questions. 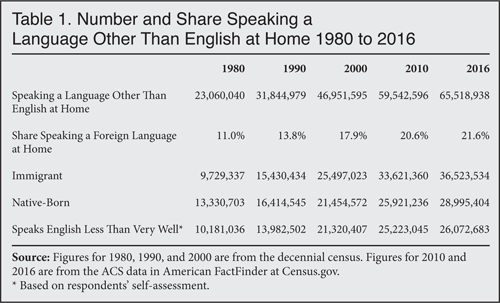 1 Unfortunately, the Census Bureau has not released the public-use data for 2016 yet, but we do know from the 2015 public-use ACS that 22.9 percent of students in public school spoke a language other than English at home in that year. We also know that in 2015, 22 percent of all school-age children ages five to 17 (in public or private schools) spoke a langue other than English at home. The data released so far from the 2016 ACS shows 22.5 percent of all school-age children speak a language other than English at home. Based on the pattern in 2015, we estimate that 23.3 percent of public school students in 2016 spoke a language other than English at home. 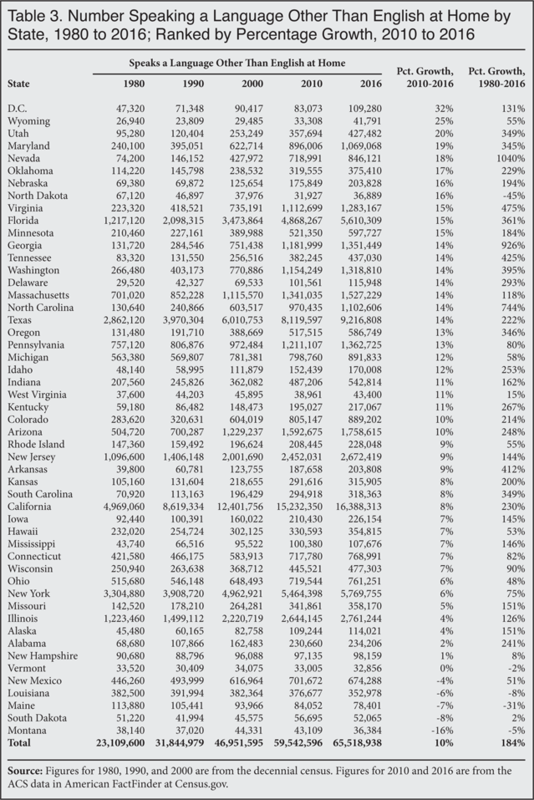 It should be pointed out that immigrants are more likely to send their children to public school than are natives. As a result, foreign-language students comprise a somewhat larger share of students in public schools than they do the overall school-age population. 2 Of the native-born who speak a language other than English at home 10.3 million (35.6 percent) are ages five to 17; the remaining 64.4 percent (18.7 million) are adults. 3 There is some other data that does measure the English language ability of U.S. residents, including those who speak a foreign language at home. The Program for the International Assessment of Adult Competencies (PIAAC) measured English literacy among a representative sample of Americans between 2012 and 2014. Publicly available data from the PIAAC shows that among people who spoke a foreign language most often at home, 49 percent scored "below basic" on an objective test of English literacy — including immigrants and the native born. "Below basic" has been likened to functional illiteracy. These results must be interpreted with caution, however, due to differences in question wording. The PIAAC asks which language is spoken most often at home, whereas the Census simply asks if a non-English language is spoken at home. Furthermore, about a third of PIAAC participants did not answer the question about language use at home, for reasons that are unclear. See Jason Richwine, "Immigrant Literacy: Self-Assessment vs. Reality", Center for Immigration Studies, June 21, 2017. 4 Detailed information on the survey methodology, questions, and other information on the American Community can be found here. 5 American FactFinder can be found here. 6 The Department of Homeland Security uses the ACS as the basis for its estimates of the illegal immigrant population. For its most recent iteration of the unauthorized immigrant population, see Bryan Baker and Nancy Rytina, "Estimates of the Unauthorized Immigrant Population Residing in the United States: January 2012", Department of Homeland Security, Office of Immigration Statistics, March 2013.